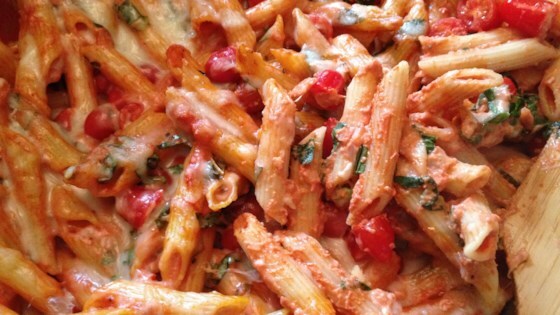 "One of my favorite midweek pasta bakes - my whole family loves it and there is not much prep. Once the pasta bake is in the oven, you can make a salad or set the table and then it's time to eat." Bring a large pot of lightly salted water to a boil. Add penne and cook, stirring occasionally, until tender yet firm to the bite, about 11 minutes. Drain, reserving 1 cup of cooking water. Heat olive oil in a large skillet over medium heat and cook onion until soft and translucent while penne is cooking, about 5 minutes. Add garlic and cook an additional 30 seconds. Stir in tomato sauce and tomato paste and cook until slightly reduced, about 5 minutes. Add cream and Parmesan cheese and season with salt, pepper, and sugar. Stir some pasta cooking water into the sauce and add cooked penne. Remove from heat and stir in cherry tomatoes, 1/2 the mozzarella cheese, and basil. Pour penne mixture into the prepared baking dish and cover with remaining mozzarella cheese. Bake in the preheated oven until cheese is melted, about 20 minutes. This pasta dish is a wonderful blend of savory and creamy. YUM!!!! We keep making it and it's always a hit! WELL, THAT WAS A DISH. NOT A VERY PRETTY ONE, NOT PORCELAIN, BUT A DISH.